THE HAGUE - Dutch caretaker Minister of Foreign Affairs Bert Koenders expressed his commitment to seek the assistance of the European Union (EU) and the United Nations (UN) following a meeting of the Kingdom Council of Ministers on Friday. The European Union (EU) will be asked to free up funds for St. Maarten and there has been contact with the United Nations (UN). In Koenders’ opinion the funds of the EU solidarity fund for natural disasters should be evenly distributed whereby all affected islands can make use of the EU fund, no matter their constitutional statu s, whether they are an autonomous country in the Kingdom like St. Maarten, or as a part of France like Saint Martin. European Member of Parliament Agnes Jongerius of the Labour Party PvdA will address this matter in a meeting of the European Parliament with the European Committee on Wednesday. Minister Koenders said he could not give an indication of the size of the financial assistance, but he did note that the transition from emergency relief aid to reconstruction aid was “fluid and arrives more quickly than one might think.” Koenders said that a “great challenge” lied ahead and that the lessons learned of Hurricane Luis in 1995 should be used in the recovery process. K oenders announced that he would bring up what he termed the “catastrophic situation” when he attends a UN meeting in New York next week. He said that the crisis team of the Ministry of Foreign Affairs has already been in contact with UN’s Office for the Coordination of Humanitarian Affairs (OCHA). “We want to work in a pragmatic manner as much as possible with organisations that can quickly respond. That is also why we work together with France and the United Kingdom. We are all in the same region and we face similar issues in dealing with this disaster. Both the coordination and the setting of priorities is important, areas that the UN has the know-how and the capacity for,” Koenders told The Daily Herald. The Kingdom Council of Ministers gathered on Tuesday in an extraordinary meeting to discuss the current situation in the Windward Islands and the devastation caused by Hurricane Irma. The meeting was of an informative character, and no specific decisions were taken. St. Maarten Minister Plenipotentiary Henrietta Doran-York said the atmosphere at the meeting had been positive and constructive. “The solidarity is tremendous. 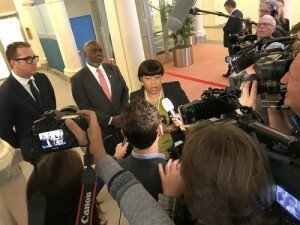 The members of the Dutch cabinet are very supportive,” she told the media after the meeting, with Ministers Plenipotentiary Anthony Begina of Curaçao and Juan-David Yrausquin at her side. Asked by the media about the Dutch emergency assistance and the reconstruction period immediately afterwards, Doran-York said, “The Netherlands is doing everything what is necessary to help St. Maarten.” She also thanked Aruba and Curaçao for their assistance and commitment. The Dutch media asked her whether she had any indication of the ballpark figure that would be needed to rebuild St. Maarten. She said that first an assessment would have to be made and that after she had made contact with St. Maarten Prime Minister William Marlin, she would be able to provide more information on the reconstruction plan. She did say that “a lot of money” would be needed. She said that communication with the St. Maarten Government had been limited, but she was hopeful that she would get in touch with Marlin today. inister of Security and Justice Stef Blok said that the security situation on St. Maarten had been restored and that the Pointe Blanche prison was functioning, with the assistance of Dutch Defence personnel. There is a full mandate to act harshly against looters and robbers. Defence Minister Jeanine Hennis-Plasschaert said that the military would remain on the island for a while.